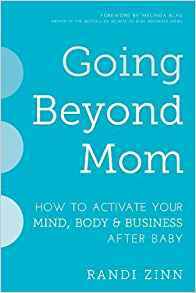 Randi’s first book Going Beyond Mom: How To Activate Your Mind, Body & Business After Baby, is now available at bookstores and online. I don’t do guest posts often, but I wanted to bring to your attention the latest author in all thing motherhood/self-care, Randi Zinn. As moms, we are usually the first to react as CEO of the family but the last to take care of ourselves. It’s time to change that dynamic and slowly but surely, we seem to be making small cracks in a very dominated world not conducive for women. The first step is taking care of YOU. This is where I will let Randi take it away and share her favorite de-stressers that you and request on your own personal mom Christmas list. YES! Most moms are frazzled and frantic during the holiday season, between taking charge of holiday celebrations, meal prep, gift buying, decorating, and more. In fact, 44% of women say they have increased stress during the holidays, according to the American Psychological Association. The stress from these added responsibilities can have a long-lasting impact on your body and your mind that goes well beyond the holidays. Doterra essential oil diffuser: It’s simple and compact. You plug it into wall and chose the blend to match the mood you want. Peleton bike: Get your sweat on and workout conveniently at home when time is limited or babies are napping! Sip Bottle: A stylish fun bottle that will help keep you hydrated all the time. Headspace: A daily meditation app to help you connect to your breathe and silence. Randi Zinn is the founder of Beyond Mom and BeyondMom.com. Born from her own experience of motherhood, and the desire for a more connected community- Beyond Mom offers: content, podcasts, mixers, events, and retreats for forward-thinking Moms. She encourages moms to cultivate a life “Beyond Mom”- one that embraces the gifts of motherhood but expresses all that they are as individuals: creators, businesswomen, thinkers, friends, and so much more. Randi is an ambassador for Athleta and has partnered with Comptoir Des Cotonniers, SoulCycle, Mio Skincare, TOWN Real Estate, The Mother Company, Body Conceptions and IntenSati. Her writing has appeared in Honest Company Blog, FitBump, Epoch Times and Well Rounded NY. She is a certified yoga instructor through Laughing Lotus NY and has taught since 2008.